LG, known as the "other" Korean handset maker has been making its fair share in the pie of smartphone graph. Convincingly, the Optimus brand had made its name in the array of powerful and fast-processing devices. 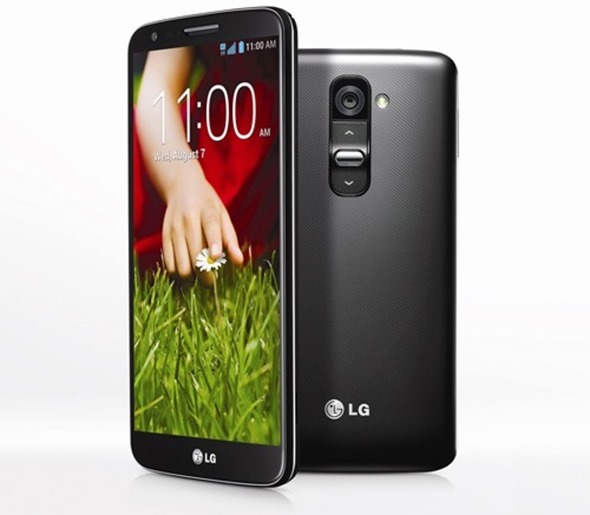 Now, it has dropped the familiar name and tagged the successor to last years Optimus G as LG G2. Before anything else, this handset packs in a speedy 2.26 GHz Qualcomm Snapdragon 800 processor and 2 gigs of RAM. Everything else is bundled in a 5.2-inch screen which displays 1080p full HD for immersive smartphone experience. This post 5-inch glory carries a behemoth 3000 mAh battery to store the right amount of juice for longer mobility. So far, it has the biggest battery in a smartphone in terms of capacity. G2 missed the cut of devices to carry Android 4.3, instead it carries the older Android 4.2.2 right off the bat. The LG G2 made a bold statement with regards to its design. Front panel houses nothing but the 2.1 megapixel front camera (sensor) and the earpiece. Both the power button and volume rocker are situated at the back of this monster phone. On the same queue is the rear facing camera with a 13MP affair. The LG G2 will be rolled out worldwide in 130 countries. The price is still undisclosed. Despite of being a performer, it's pretty interesting to see how G2 would fair with the upcoming phablets of HTC and Samsung this quarter.